This work was supported by NASA Rapid Response and Novel Research in Earth Science (RRNES) grant number RRNES-20 (NASA HQ Earth Sciences Division, c/o Dr. Jack Kaye) and via a cooperative research partnership with CSA and MDA. The team at NGA under Chalbeth Reynolds, Robert Quest Brannock, and Steve Hopkins were extraordinarily cooperative in providing critical DEM products as part of our time series of observations. The assistance and patience of the USGS CRSPP team, including Brenda Ellis and James Hak, was instrumental for obtaining the frequent DigitalGlobe WorldView acquisitions. Finally we dedicate this work to the memory of Professor Gunter Menz of the University of Bonn who was involved in an earlier component of this work. An explosive submarine volcanic eruption produced a new ~ 1.9 square kilometer island in the southwestern Pacific Ocean in the Kingdom of Tonga between mid-December 2014 and the end of January 2015. The ~ 150 meter tall volcanic island, hereafter referred to as Hunga Tonga Hunga Ha’apai (HTHH), was formed by hydro-volcanic eruption processes leading to the construction of a classical tephra cone volcano with flank pyroclastic flows. High resolution satellite imaging began just after the end of the construction phase using the DigitalGlobe WorldView system, and shortly thereafter with the Canadian Space Agency’s (CSA) Radarsat-2 C-band Synthetic Aperture Radar (SAR). Digital Elevation Models (DEM) were produced periodically by the National Geospatial-Intelligence Agency (NGA) using Worldview images in a time series that began in May of 2015. (< 1m). Comparisons of the continuing evolution of the new Tongan island (HTHH) with the Icelandic type-locality for such submarine eruptions (Surtsey) illustrate differences potentially due to the composition of the explosive ash and to a general absence of erupted lavas at HTHH. In addition, differences in the rates of erosion at HTHH and Surtsey in comparison with similar-appearing landforms on the planet Mars permit assessment of the volcanoes on other worlds where erosion is likely to have operated as a function of past environmental conditions. On the basis of two years of satellite observations in three-dimensional context, the anticipated lifetime of the new island in Tonga is likely to be on the order of ~10 years, although a low-relief isthmus in the vicinity where the new island formed could persist for decades. This NASA and CSA-supported study showcases the potential for quantifying the evolution of Earth’s most dynamic landscapes from meter-resolution satellite remote sensing capabilities that now offer both scientific and societal benefits. The birth of a new island in the southwestern Pacific Ocean around Dec. 19, 2014 via tephra-dominated hydro-magmatic processes (surtseyan-style) was witnessed by NASA’s Earth Observing System sensors during the course of its month-long construction phase. Such eruptions are not uncommon in this region and similar events occurred in 2008-2009 with ephemeral island formation and subsequent destruction over a period of months. http://rainypass.com/faq/ buy now 4 The opportunity to take advantage of newly-available satellite-based imaging systems at both optical and microwave (C-band SAR) wavelengths with meter resolution presented itself as a worthwhile demonstration of space-based landscape monitoring techniques at new temporal and spatial scales ( click here Figure 1). In addition, by means of continuous monthly observations at scales relevant to the magnitudes of episodic erosional events, measurements of the intensity and vigor of processes rarely witnessed became possible. DigitalGlobe WorldView-2 image (Sept. 2, 2016) ray-traced atop a DEM produced on the basis of WorldView satellite stereo images from Aug-Sept. 2016 (by NGA) illustrates the evolution of the HTHH island from birth (yellow outline of coastline) to present status. This view is from the southeast looking across the new island (HTHH) with the pre-existing islands of Hunga Tonga (right side) and Hunga Ha’apai (upper left) shown. Image courtesy NGA. 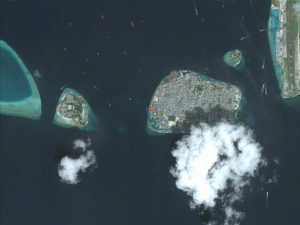 A systematic campaign for coordinated satellite observations was developed for the purpose of quantifying the erosional rates and processes for the new island in comparison with current understanding of the evolutionary sequence for typical oceanic islands.5 Monthly optical satellite images from DigitalGlobe’s WorldView imaging system were arranged via the U.S. Geological Survey’s Commercial Remote Sensing Space Policy (CRSSP) program. Acquisition of Radarsat-2 SAR images in two independent viewing geometries every 24 days was arranged in cooperation with the CSA Radarsat-2 Background Mission. As part of this study, observations have been systematically collected since March 2015, and it is anticipated that monthly collections will continue. Ship-based observations were also coordinated on the basis of initial results and the Schmidt Ocean Institute (SOI) Research Vessel Falkor measured deep water bathymetry around HTHH in Spring of 2016. In this article, we focus on the subaerial expression of the island, its coastline evolution, the rate of change of the volume of the central tephra cone, and its projected lifetime as a benchmark system within the southwestern Pacific Ocean. The application of results achieved for HTHH for small hydro-magmatic volcanoes on Mars is also considered. 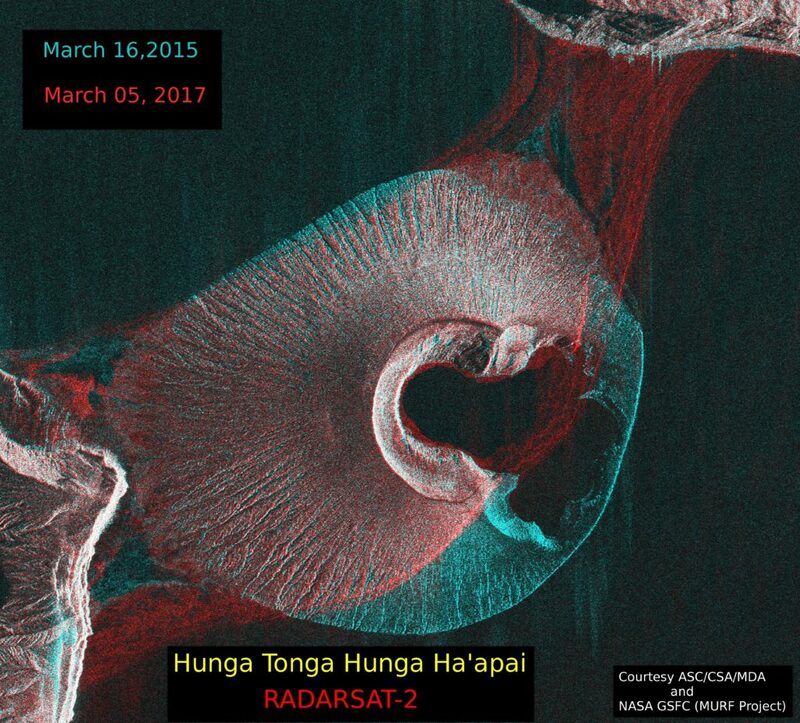 Time series of optical (DigitalGlobe WorldView-1, 2, 3) and CSA Radarsat-2 Spotlight SAR images were acquired, when possible, starting in March 2015 through March 2017, covering more than two years in the life of the Tongan island. NGA-developed Digital Elevation Models from the WorldView images were provided in multiple time intervals, including May 2015 and August/Sept. 2016. 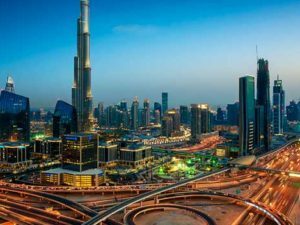 Ancillary data from the German Space Agency (DLR) TanDEM-X SAR System have been folded into the preliminary assessments conducted thus far as well. In the first few months after island formation, rapid erosion of the southern coastal region resulted in loss of ~ 5% of the island’s initial volume, with redistribution of the derived sediments to form a connecting isthmus to the northeast with the pre-existing Hunga Tonga island. The intensity of marine abrasion from the south attacked the weakly indurated tephra that formed the southern rim of the interior crater, leading to its collapse by May 2015, and promoting re-deposition of the eroded materials to the northeast. Coastline changes documented from the integration of WorldView images (Figure 2) with NGA digital topography and Radarsat-2 SAR (Figures 3, 4) documented the evolutionary pathways established at this time. 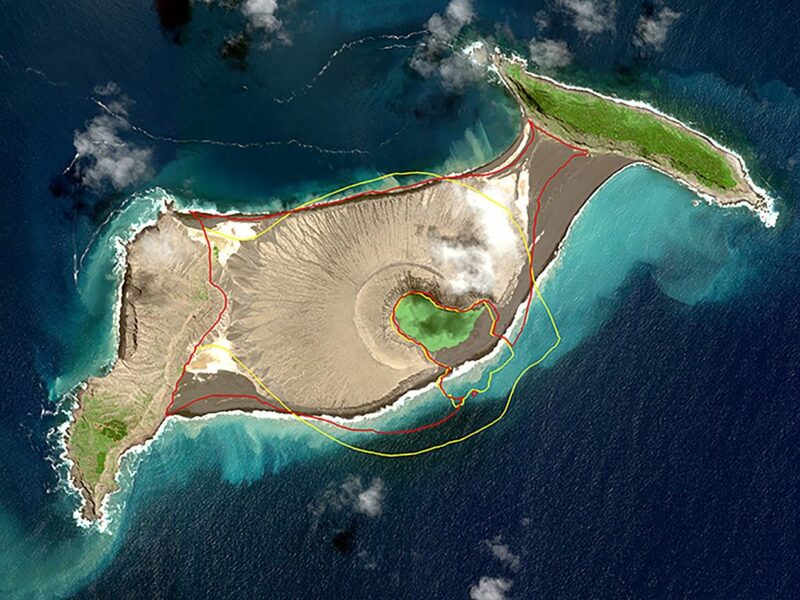 On the basis of recent experience4 it was not anticipated that the initial HTHH island would survive as a discrete subaerial volcano for more than several months. of the original island just after the end of volcanic construction in January 2015. The red outline is the coastline geometry as of early 2016. The development of accreted sandy isthmus regions to the northeast and west of the core of the new island is apparent. Courtesy NGA. The topographic evolution of the island is of particular interest because it is intimately linked to overall island survival within the classical evolutionary sequence outlined in the scientific literature.2, 5 On the basis of multiple DEM time-steps starting around May 1, 2015 and extending to September 2016, we have witnessed the general decay of the central core of the island from an initial post-eruptive volume of 0.070 cubic km to its current state at ~ 0.053 cubic km. At this rate of primary “core” island loss, the survival of the main edifice beyond ~10 years is not assured. After more than two years of satellite high-resolution monitoring of Earth’s newest land, the pace of erosion appears to have temporarily slowed. While continued wave attack from the southeast remains in effect, leading to pulses of deposition to the northeast, the general island outline and its isthmus deposits has remained relatively constant for multiple months. Evidence of inner crater wall mass-wasting and development of a sediment bench region is now apparent in the most recent CSA Radarsat-2 SAR images (Figure 4). CSA Radarsat-2 SAR (SLA21 mode) image from March 11, 2017 shown as inverted total backscatter to emphasize the stratigraphy of the erosional patterns at the island. Inner crater mass-wasting and isthmus strandline depositional processes are evident. Images such as this have been acquired every 24 days since March of 2015 by the CSA Radarsat-2 Background Mission as part of research activities to document the evolution of small, sensitive oceanic islands as “barometers” for global change signatures. 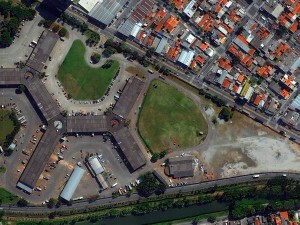 North is to the upper right and the field of view is 2 km across. 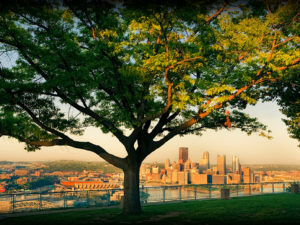 Image courtesy MDA and CSA. 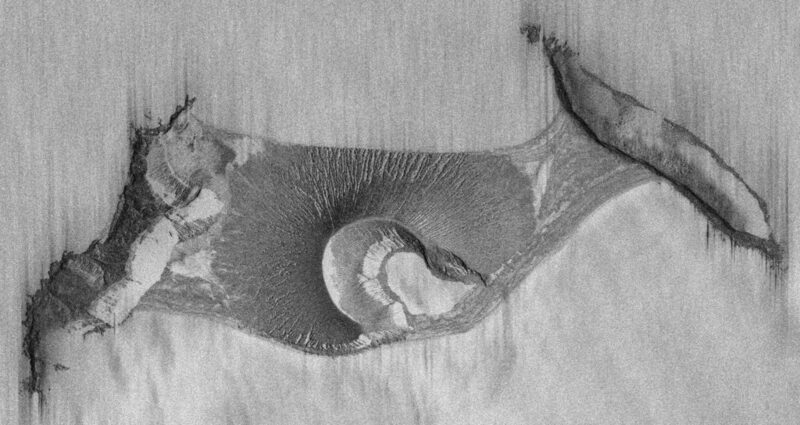 Such SAR images are particularly effective when processed with their total backscatter inverted so that they appear as “shaded relief” style maps. Our work with SAR and optical images registered to the NGA- developed DEMs has documented the rates of erosion under the geologic and environmental conditions in the southwestern Pacific. Whether HTHH survives as a volcanic edifice for decades as Surtsey has since its period of formation in the 1960’s will depend on development of internal stabilization via palagonitization2 or other processes which cement friable volcanic ash into mechanically stronger materials. By continuing to measure both topographic and spatial changes at HTHH as a benchmark oceanic volcanic island, we anticipate the telltale signatures of the next pulse of large-scale erosional adjustments will be detectable and therefore quantifiable. It is now possible to quantify the evolution of dynamic landscape systems from their time of formation until they are little more than relicts. Using current satellite imaging capabilities and topographic generation methods provided by collaborators at NGA, we have analyzed the erosional evolution of Earth’s newest land in the Kingdom of Tonga. By combining time-series images from DigitalGlobe WorldView, CSA Radarsat-2, and digital topography, we have estimated the lifetime of the central core of the new volcanic edifice as ~ 10 years if current rates of erosion continue over the next few years. This extrapolation can be tested with continued monitoring of the island as evidence of internal stabilization is sought on the basis of localized changes in the steep inner crater walls. On the basis of the rates of landscape evolution at HTHH in comparison with Surtsey (North Atlantic), we can now examine the likely timelines for evolution of small kilometer-scale hydro-volcanic edifices in the northern plains of Mars. This work supports the current models developed within the Mars scientific community3 that many of these small edifices formed rapidly, only to degrade very slowly over geologic time-scales. Future Mars missions will test the idea that some of the Martian analogues to island volcanoes such as HTHH may have formed rapidly and then eroded due to hydrologic processes at rates that no longer exist today on the Red Planet. 1. Garvin, J. B., R. S. Williams, Jr., J. J. Frawley, W. B. Krabill (2000): Volumetric evolution of Surtsey, Iceland, from topographic maps and scanning airborne laser altimetry, Surtsey Research 11, 127-134. 2. Wohletz, K. and M. Sheridan (1983): Hydrovolcanic Explosions II: Evolution of Basaltic Tuff Rings and Tuff Cones, American Journal of Science, Volume 283 (May 1983), p. 385-415. 3. Broz, P. and E. Hauber (2013): Hydrovolcanic tuff rings and cones as indicators of phreatomagmatic explosive eruptions on Mars, Journal of Geophysical Research: Planets, Vol. 118, 1656–1675, doi:10.1002/jgre.20120, 2013. 4. Vaughan, R.G. and P. Webley (2010): Satellite observations of a surtseyan eruption: Hunga Ha’apai, Tonga, Journal of Volcanology and Geothermal Research. 12/2010; 198(1-2):177-186. DOI: 10.1016/j.jvolgeores.2010.08.017. 5. Nunn, P. (1994): Oceanic Islands (Natural Environment), Wiley-Blackwell Press, London, 360 pages.